Last week I wrote to several politicians asking them to basically stop locking up asylum seeker kids. The good news is I got a response from my local member, Philip Ruddock. The bad news is that it could not have been more disappointing. Here’s a PDF of his response. The cynics among you will of course roll your eyes, tsk tsk and think “Well, what did you expect?” Don’t get me wrong, I certainly didn’t expect that the government would repent, compensate the detention centre inmates, and make other amends. I did expect my questions to at least be addressed. I was even prepared for a bit of a templated letter. But what has really incensed me is that he stated the complete opposite of what I asked: to please help separate the issue of the treatment of people already in our national care (especially children) from the issues of turning back boats. In short, the ‘fight against people smugglers’ should not be taken out on children. Thank you for your recent letter, I appreciated the prompt response. Although I don’t agree with your own position nor that of the Coalition Government, I still respect the work you’ve done for years in this area. Separate the issues of the treatment of people – especially children – in our national care from the legal issues surrounding asylum seeker treatment? Change the agenda and public conversation (through the media and other means) from one of legalese, fear and poverty of spirit to be more of compassion, creative thinking and leadership, and opportunity? If anything, you expressed the opposite of what I asked: you’ve conflated the issue of fighting people smugglers with the issue of maltreatment of children in detention. They should not be related like that. Firstly, I and many others, including organisations like the Australian Human Rights Commission, Amnesty International and Refugee Council of Australia dispute the Department of Immigration and Border Protection’s terminology of ‘Illegal Maritime Arrivals’. It is not a crime to enter Australia without authorisation for the purpose of seeking asylum. Asylum seekers do not break any Australian laws simply by arriving on boats or without authorisation. As I’m sure you’re very aware, Article 31 of the Refugee Convention clearly states that refugees should not be penalised for arriving without valid travel documents. What may be considered an illegal action under normal circumstances (e.g. entering a country without a visa) should not, according to the Convention, be considered illegal if a person is seeking asylum. Also, framing asylum seekers as ‘IMAs’ is dehumanising, creates barriers to the community understanding the issues affecting asylum seekers, and confusion that can fuel conflict, resentment and disharmony. 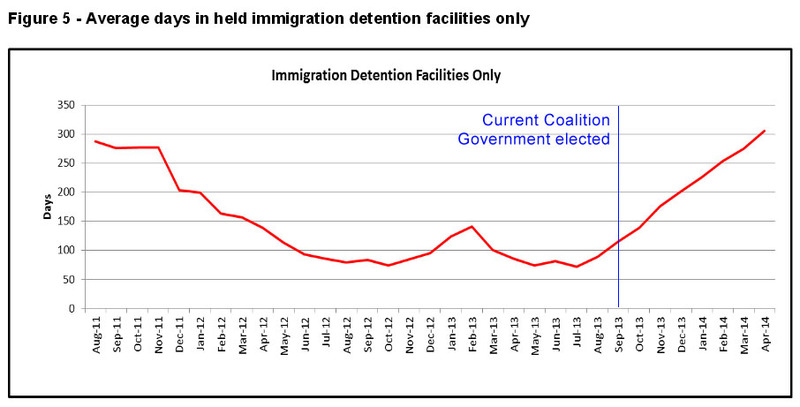 To your point about health, security and checks to be undertaken: the Immigration Detention and Community Statistics Summary Report published by DIBP states “The average period of time for people held in detention facilities is steadily increasing to 305 days as at 30 April 2014.” 18% are held for over a year. Over a year, Mr Ruddock. In the US (the top receiving country of asylum seekers per capita in the past five years), cases must take no longer than 180 days of an application being filed. Sixty days is normal. Other countries like UK and Denmark don’t even detain asylum seekers; they can live normal lives while their claims are processed. To your point about it being in the best interests for the children to remain with their parents: that statement is completely empty of reason when child self-harm is “shockingly high” and parents are prepared to sacrifice themselves to give their children a better life. To your point about not taking a backward step in the fight against people smugglers: that has simply nothing to do with locking up children for over a year. And taking such a ‘fight’ out on children is amoral and unconscionable. Why are over 1000 kids still in detention? Recent moves by Scott Morrison (the Minister for Immigration and Border Protection), as well as ongoing cruelty to children in detention have bugged me hugely for a long time. So I wrote a bunch of letters to politicians on the weekend. And I thought I’d put the letter in this post, because this is something you might have wanted to try but needed a nudge. Scott Morrison has gone from publishing the much-slammed Big Brother go-back-to-where-you-came-from video, to spending our money playing legal word-games in several courts, to actively keeping us in the dark about what the government knows and doesn’t know about boats. Only this week, the secretive action continues, with Sri Lankan refugees being turned back to face ‘enhanced imprisonment’, something that former Prime Minister Malcolm Fraser has termed “piracy on the high seas”. But what really gets me is the blind eye and inaction on the child abuse going on in these detention centres, and that we’re flouting international law and doing nothing about it. And I’ve really had a gut-full. And there’s loads of organisations who have had a gut-full too, and who are working in the community to agitate for change. Organisations such as Love Makes A Way, Chilout and End Immigration Detention of Children. If you’re wanting to go beyond clicktivism, and civil disobedience isn’t for you, I have it on good authority that writing letters to your local member and to the MP in charge of the portfolio does help agitate for change (I’m married to someone who used to work in a parliamentary office, so she should know ;). I, like many of my friends, community members, church members and work colleagues, are feeling increasingly disturbed and dismayed at Federal Government policy – and the implementation of that policy – toward treatment of asylum seekers. I’m trying to keep this letter from being too broad and hyperbolic, so I’m focusing particularly on the facts and specifics about the treatment of children in detention. Put simply: children are being detained for longer than ever in a completely inappropriate environment, being denied decent healthcare, and (in some cases) are suffering sexual abuse for so long, that they have suicidal thoughts, are suffering mental illness, and are harming themselves. Last time I checked, there were 1,106 children kept in detention. Chilout (the child asylum seeker support organisation) quotes 1,023. Current data shows that the average length of time a child spent in detention in Australia was 231 days, with 38 children having spent more than a year in detention as of January this year. From the associated UNHCR Revised Guidelines on Applicable Criteria and Standards Relating to the Detention of Asylum Seekers (PDF): “Minors who are asylum-seekers should not be detained”. There were 128 reported self-harm incidents amongst children in detention between January 2013 and March this year. Children account for the “greatest percentage” of self-harm incidents and suicidal behaviour by asylum seekers in detention. I echo the statement by Sophie Peer (of Chilout), that Australia’s immigration detention system is child abuse, and nothing short of that. Minister, children are suffering and harming themselves because of the impact of your government’s policies, and the reckless implementation of those policies. This is toxic. This is cruel. This is morally, politically, and legally wrong. And it has gone on long enough. What are you doing to hasten the process and effect of the current inquiries into the treatment of people in detention? What actions do you expect to be taken after these inquiries? And what actions can be done now to alleviate these conditions? Children should not have to wait so long under these conditions for better treatment. What are you doing to ensure that the implementation of policy, care and due diligence toward detainees is done properly, and not handed out to completely inappropriate third parties? This is a symptom of what Prof. Triggs has called the “element of bureaucratic cruelty” that erodes the otherwise good and compassionate work that your department is trying to do. In your response, please provide specific answers to my questions. Please don’t write things like “It’s a complex matter”; I know it is complex. But I also know that stopping children from being locked up and providing decent care is certainly not complex. I also wrote letters to my own local member (you can find yours here), Shadow Minister for Immigration and Border Protection, the Prime Minister, and the Labor candidate for my electorate. Hope this letter is useful as a template to someone else out there.